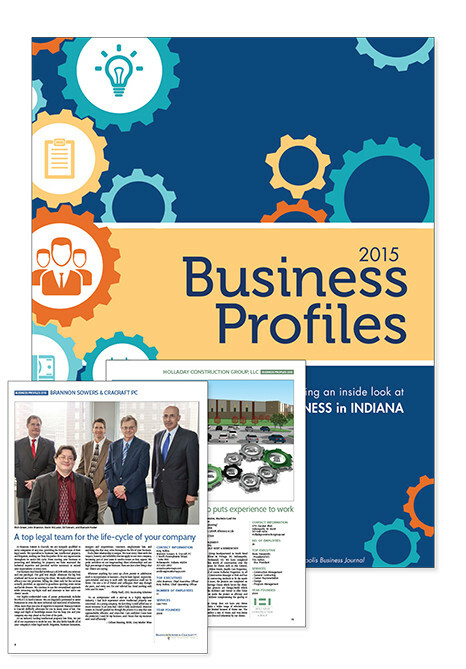 Business Profiles is a special advertising supplement of IBJ that will highlight Indianapolis businesses. Plus IBJ will drive traffic all year to this publication with ads in the paper and on IBJ.com. Considering submitting a story for IBJ's 2016 Business Profiles? be submitted in digital format. If you tell us you are the No. 1 distributor in America, the only authorized dealer for a particular manufacturer or some other such claim, we need you to back it up. You must send an independent written verification of that claim along with the manuscript or we will have to take the claim out of the story. You may prefer us to arrange for the writing. We can have a professional freelance writer contact and interview you for the story. A freelance copy editor will proof and edit all stories. You will have the chance to review the final version. • You can submit a photo to accompany your story. • It must be 9.75" x 6.5", 300 dpi, CMYK, in jpeg or tif format. of three photos from the shoot and select one for your profile. Logo must be at least 3 inches wide, CMYK, 300 dpi, in EPS or TIF format.